The Honda EU10i generator is a compact and easy to transport power source useful when you need power on the road. 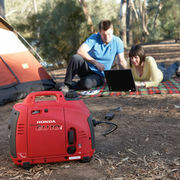 This little generator is inverted meaning that the sinewave is microcomputer-controlled delivering commercial grade electricity allowing you to power sensitive products such as laptops and phones. 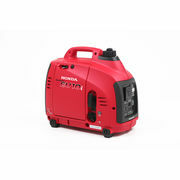 Not only does it have benefits with regards to the products this generator can run this technology also reduces the overall weight and size of the generator by 25% to 50%. The Honda 4 stroke technology has been the foundation for their success and reputation built on reliability and dependability, with their engines taking straight unleaded removing the need for tricky fuel mixing! The EU10i features a 8 Amp/ 12 Volt DC, max 1000w/240 Volt AC power levels and can run appliances while charging batteries simultaneously. The parallel connection cables mean that you can join your 1KVA generator to another to double the outage! 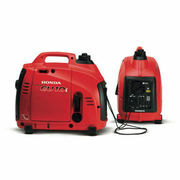 Like all Honda equipment this generator is backed by Honda's well known 4 year domestic warranty. 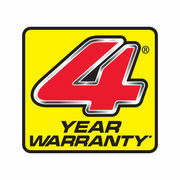 One of the biggest warranties offered in the outdoor power equipment industry as Honda back their products in for the long run and so should you. Inverted Generator meaning it delivers clean electricity so it can run sensitive products with a circuit board such as laptops and phones. Small and compact enough to be easily transported whoever you need meaning that you will always have a source of portable power that is easily accessible.